Think Paladin, think nostalgia. 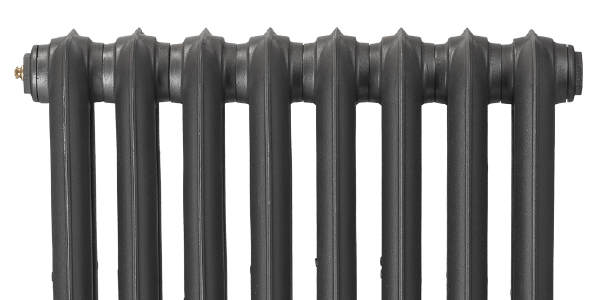 We blend tradition with innovation, charisma, quality, and craftsmanship to make a stunning selection of traditional cast iron radiators, designed to add a distinctive individual beauty to any residence traditional or modern. Why choose a Paladin cast iron radiator? Paladin cast iron radiators are like no others on the market. We focus on quality over quantity and we are the only cast iron radiator manufacturer to have our own dedicated cast iron foundry producing just for us and absolutely nobody else. We won’t use large multiproduct foundries with mass production and automation. Our casting moulds are always as sharp as the day they were created, so you can always enjoy the exquisite ornate detail you only get with a Paladin cast iron radiator. Apart from our carefully selected metals colour range we have exquisite finishes and effects available to you or you can let us know your own choice of colour and we will match it, if you want it you can have it. We are happy to offer a comprehensive range of beautiful hardwearing colours to suit almost every interior. We can offer you something unique, each and every cast iron radiator is a distinctive individual creation, offering your project something special. Our talented craftsmen can highlight or antique the beautiful detail of your ornate cast iron radiators or we can polish them to perfection. Your cast iron radiator can be as vibrant as you need it to be. If you do have a particular colour in mind, we can Colour Match it, mix it and paint it. We are also proud to partner with Farrow & Ball to offer one of the most exclusive ranges of colours available in the UK. All our products are hand assembled and finished in the UK, to maintain the British heritage that for two decades has been synonymous with Paladin cast iron radiators. Our ethos at Paladin has always remained the same: All our radiators are hand-built and finished and tested in-house at our UK factory based in Lincolnshire. We invite you to witness the unique blend of tradition and innovation for yourself at our on-site showroom. Our cast iron radiators are beautifully detailed. From ornate finishes to bespoke paint match options or maybe you want your radiator polished to a mirror shine? You need to see and feel them to believe them. Here, at Paladin, we believe in a personalised purchasing experience ‘Add to basket’ just doesn’t do our stunning hand-crafted radiators justice. We offer you full technical support and advice on every aspect of selecting your radiators. We are more than happy to discuss things with you and help work out your own unique requirements. We will make sure you have chosen the right radiators to complement your home or project. Visit our showroom, email or call us today! Extremely helpful over the phone, and the radiators are beautiful. A bit of constructive criticism - I would look for a different delivery firm as myself and a friend had to lift them in from the driveway (pavement delivery only), and also consider offering an installation service. I would gladly have paid extra to have the radiators installed and running on day of delivery. I could not believe the quality of my chosen radiator when it arrived. I was a bit apprehensive when I first ordered, because not seeing it first hand, I really need not have worried at all. The team were fantastic from the start of the ordering process to the delivery. Even the delivery driver was exceptional. Great company to work with, could not praise them enough. Fantastic looking radiator I would recommend Paladin Radiators to to anyone looking for something a bit different at a price that I am certain cannot be beaten by any other company. An excellent service from start to finish. The BTU calculation differed from some of the online options, but they did go into far more detail. It was an expensive item, but it simply exudes quality. The fit and finish is exemplary. Highly recommended.